The Business Aviation Safety Summit (BASS) is a forum for the industry to meet in a collaborative environment to identify safety concerns, devise approaches to reduce risk and implement initiatives to improve safety. 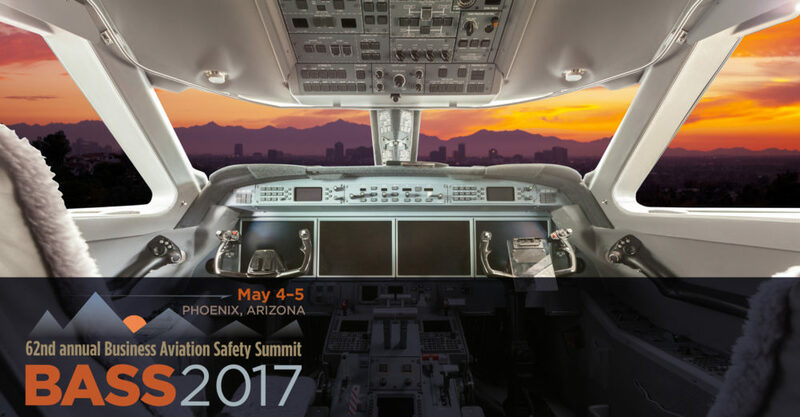 The summit, in its 62nd year, is organized by Flight Safety Foundation in partnership with the National Business Aviation Association. Content covers safety, training, practical solutions, management, human factors and other issues for every segment of the business aviation industry. Programming is complemented by an exhibit marketplace showcasing aviation safety related products and services. Thanks to everyone who attended BASS 2017. Keep watch to <flightsafety.org> for an announcement on dates and location of BASS 2018. BASS 2017 participants looking to access available presentations from the event should first complete the survey sent by email on Friday afternoon, May 5 from FSF Events. At the end of the survey will be the link and password to access speaker presentations. If you did not receive the email survey, contact events@flightsafety.org for assistance. Join the Honorable Christopher Hart, Member, U.S. NTSB, for an update on Thursday afternoon, May 4 from 1600-1625. Distinguished aviator Ron Mumm will deliver the keynote address on Thursday morning, May 4. Mumm will share his thoughts on teamwork and the key to high performance. For the last 18 years, Mumm has led business aviation operations for high-net Individuals, family offices, and Fortune 50 corporations. He still actively flies a Cirrus SR22, and was previously, and proudly, an SR22 owner. Read more about Ron Mumm. Join Dr. Daniel Mollicone, CEO and President, Pulsar Informatics; Mr. Fred Calvert, Director of Safety & Emergency Response Planning, Executive Jet Management; Capt. Jim Kelly, Pilot / Safety Manager, Pfizer Aviation; and Capt. David Belastock, Demonstration Pilot, Dassault Falcon for a panel discussion on fatigue management. Friday morning, May 5, from 1030-1100. View the full program. Organizations that register three or more participants from the same company using the same email domain receive a 10% discount off applicable full summit fees. All registrations must be made at the same time and paid with the same form of payment. More details.